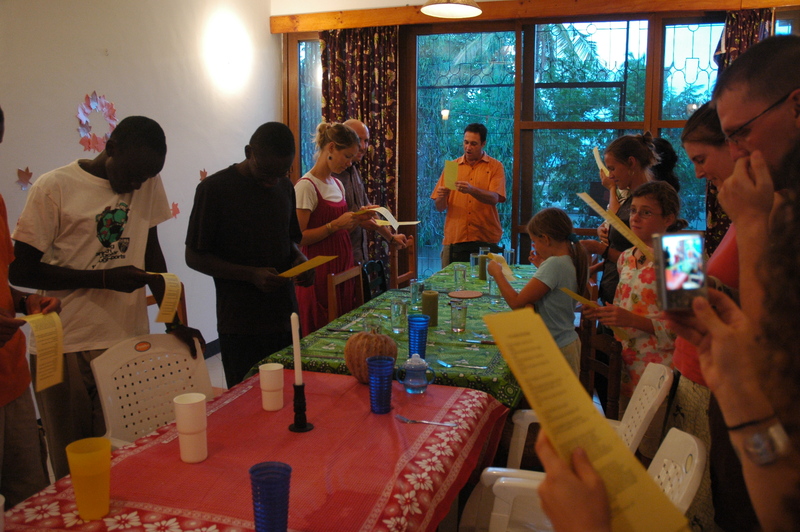 November | 2009 | KARIBU! Once again we had the opportunity to help our friends Brandon and Amanda out with the village work that they do. Today they put together a Swim Day at the Hopac campus. 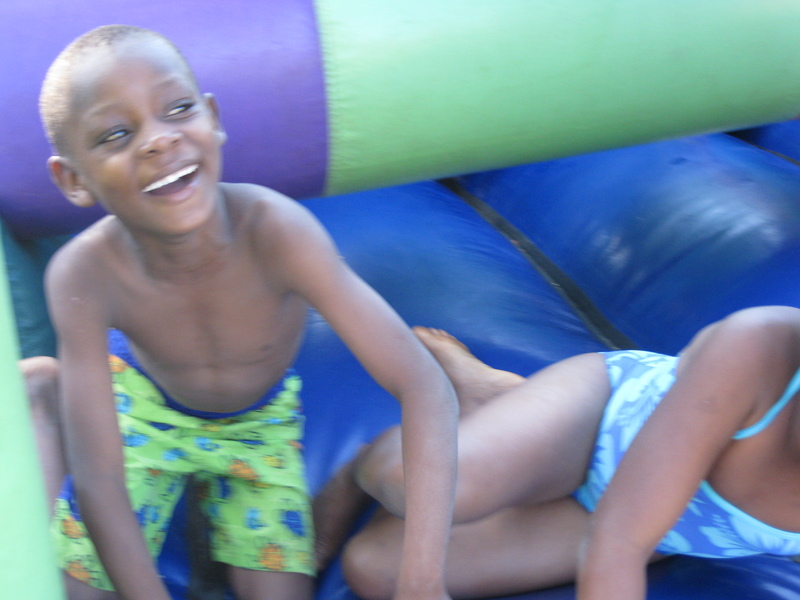 William the Pastor of the village, and a worker at HOPAC, brought about 40 kids in a Dala Dala over to HOPAC to spend some time in the water, to eat and to play in a jumping castle. The kids are so cute, and since we have met them before, we are starting to be able to remember names. The range from age 4 to age 18. They are always excited to be around you and always want you to play. Even though they all live so very close to the ocean, many Tanzanian’s have no idea how to swim. So this is a great opportunity for them to get some basic swim skills down in a safe setting. A few of them have a few skills and are tall enough to stand in the shallow end. Many are able to use a noodle and float around but do not have any real swimming skills. Then there are those who have no swimming skills and need to use your body as a buoy at all times. There were only 5 adults in the pool for all of these kids, one of which did not know how to swim very well. So the four of us jumped in and started playing. With so many kids you have to rotate who you are holding and make sure everyone is getting a turn. They really loved jumping from the side, learning how to kick and of course the favorite 1, 2, 3 and under game. We really love working with the village kids and are hoping to do more and more with them. If anyone knows me, they know that I am not the queen of cooking. Although I am well known for making boxed Betty Crocker Funfetti and other such cakes, cooking from scratch has never been my forte. However, here in Tanzania, if you want anything to taste like home you have to make it all from scratch. First you have to find and figure out which ingredients will work. Many ingredients are very different from what you would buy in the States, therefore you must find alternatives to use. Thankfully there are many other people who have been here awhile who can give me good advice about what will work best. When we first arrived, we ate our fill of rice and beans. After a few weeks of that I decided that we had to get more variety in our diet. Most of the girls who live here know how to cook quite well. Moving in with two other females who cook well has really inspired me to figure out how to do this cooking thing. I have experimented with a few different items so far. Salsa is a staple for us and I knew how to make it before, now it is just a matter of perfecting it. I really need some good cilantro to do so, but until our cilantro grows I will have to do with out. French toast, pancakes (no bisquick), and homemade spaghetti sauce were among the first things on the menu. All of them simple, most of them I already knew how to make. I wanted to start it off nice and easy. Then we began to learn how to make some new things, like hummus, Spanish tortilla, and cream cheese. I would not say I have perfected the hummus yet, every time it seems to get better. After that I made tacos for some of my students. They were delicious. Not quite like some good South side Mexican, but the best I have had here for sure. Then Thanksgiving came and I had to be ready to make everything in a day’s time. I felt a bit of a panic but thankfully, Austin is a very good chef and I had his help the whole time. Green beans with bacon, stuffing, mashed potatoes, roasted chicken, brown sugar glazed carrots, sweet potatoes, gravy and apple pie. It was a lot of work, but Austin and I really do make a great team when cooking. My latest recipe was Pumpkin Soup. I had no idea it was so east to make from scratch. Even though, I am constantly hot and sweaty here, I actually want to eat this soup. Cheers to that. I just had my mom, dad and a few others email me recipes so that I can keep this up. Feel free to email me any of your favorite recipes!